Just the other day, a friend told me that he made over a million dollars in hedge fund bonus last year. He’s the guy Occupy Wall Street has been protesting against. The surprising thing is, he isn’t the first person to tell me that he broke the million dollar hedge fund bonus ceiling. 3 other hedge fund analysts told me the same last year. So how do people in their late twenties and early thirties make over a million dollars at a hedge fund? Who’s paying out this kind of dough? Let’s find out. First, we’ll start with how a hedge fund makes money. Then we’ll talk about what type of hedge funds have the most compensation upside, and what factors would drive your hedge fund bonus. The hedge fund business model. How hedge funds make money, and how you get your share. How hedge fund fees have trended over the past few years. What type of hedge funds would give you carry, and how you can get it. The most important drivers of your carry bonus. What the risks are of getting hedge fund carry. Hedge fund fees typically have two main components: management fee and performance fee. Management fee is the flat rate charged on the total assets a fund manage. It usually ranges from 1 – 2%. Funds that typically charge higher fees than industry average typically have consistent above-average returns and good branding. Citadel, Fortress, and Point72 come to mind. The purpose of the management fee is to cover operational costs of running the firm. They include office rental, technology, employee base salaries, and compliance and legal costs. Let’s imagine that you are a hedge fund analyst at a long/short fund called Cedar Capital. Cedar currently has 500 million of assets under management, and the portfolio manager has had a good 5-year track record and charges a 2% management fee. 2% of $500 million is $10 million. Not bad. It covers a small office rental, employs 3 – 4 analysts plus compliance, legal and admin personnel, and pays for Bloomberg, trading platform, and fund custodian. That’s a nice start to making money for the fund. But performance fee, or carry, is the more interesting piece of the two. This is the piece that will determine your bonus as a seasoned hedge fund analyst. It’s a percentage of the return on the assets under management and can range from 10% to 30%. Let’s go back to Cedar Capital. Your portfolio manager charges a 20% performance fee because of the good performance. Last year you guys made a killing and generated a 30% return, which made your fund world famous. A 30% return on $500 million of assets under management is $150 million. The fund gets 20% of that as the performance fee, which is $30 million. Not bad for a small team of 8 – 10 people. Not bad at all. Your portfolio manager takes the majority of the winning and splits the rest among the analysts and office personnel. This is an example of a hedge fund with no hurdle rate or high water mark. Let’s talk about these two concepts. A hurdle rate is the required return before a fund can earn performance fee. It’s the benchmark rate for a fund. For example, let’s say that Cedar Capital has a 5% hurdle rate. The fund made a 30% return. The performance fee is only earned on the 25% return above the hurdle rate. This is the fund’s generated alpha. Funds usually also have a high water mark, which is the previous highest fund value. High water marks are set periodically. If a fund has a high water mark, it can’t collect performance fees unless the existing fund value is above the high water mark. Let’s go back to the Cedar Capital example. If the current high water mark is $1 billion, then it would not collect any performance fees despite the fund returning 30% for the year. The fund would’ve lost 50% in the previous year, resulting in assets decline from $1 billion to $500 million. Both the hurdle rate and the high water mark protect hedge fund investors and are standard practices in the industry. 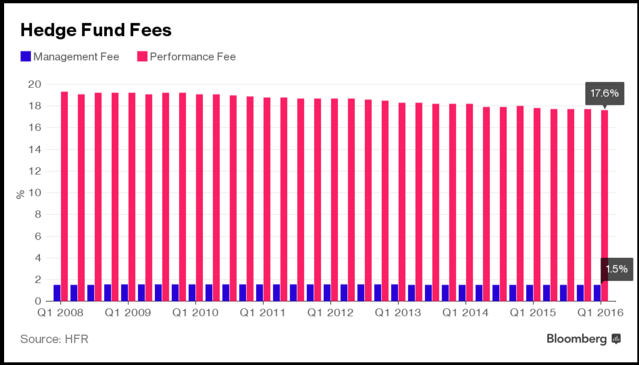 The 2/20 you hear about used to be the standard fees hedge funds charged: 2% management fee and 20% performance fee. Does that still hold true? Competition within the hedge fund space has intensified since the financial recession. Each year there has been 100 – 200 new funds opened on a net basis (1). Furthermore, average hedge fund returns have dwindled over the same period. Average equity funds returned 15.5% in 2013. In 2015, equity funds returned a mere 2.02% – barely beating 10-year treasury yields. Competition is certainly a main contributing factor to diminishing returns. At the same time, the macro factor has become a bigger driver of market performance. Global central banks have taken unprecedented measures to drive bond and equity market liquidity and demand. When macro drivers become more important, idiosyncratic (company-specific) drivers become less relevant. Individual stock picking has gotten harder. Because of intensifying competition and lower hedge fund returns, both the management fee and the performance fee have come down across the industry. Average performance fee has gradually declined to 17.6% according to Hedge Fund Research. 2/20 is no longer the gold standard for hedge fund fees. 1.5/17 is the new normal. How Much Hedge Fund Carry Should You Get? Let’s come back to you. 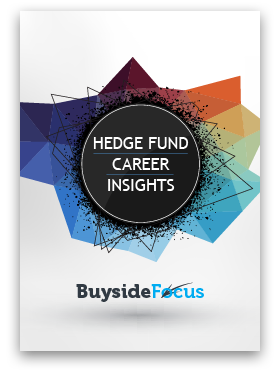 What bonus should you be getting working as a hedge fund analyst? First, it differs by fund size. Mega funds and small funds pay differently. As a hedge fund analyst at a mega fund like Citadel and Point72, your bonus will still be in cash given on a discretionary basis. It depends on how hard you’ve worked, how much value your research has contributed, and how well you fit with the team. In other words, it’ll depend on your portfolio manager’s impression of you. It’ll be very difficult to directly get a part of the fund’s performance fee at a mega fund below the Principal / Partner levels. On the other hand, small funds are where you can make your fortune. Let’s go back to our Cedar Capital example. When you first join the fund, your bonus will still be in discretionary cash. However, as you prove yourself, it’s very realistic to get a piece of the performance fee directly as your bonus. This is even more true if you join a start-up hedge fund. You could expect to get part of the carry from day one. Imagine that you are a year into your hedge fund analyst job at Cedar Capital. Your contrarian research has directly contributed to the funds’ stellar 30% annual return. Your portfolio manager loves your work and would like to offer you 1% of the carry, or performance fee. Good for you! your road to riches has begun. But what is 1% worth? Is that enough for you? The expected fund return going forward. The amount of asset inflows the fund can raise. How your share of the carry increases over time. Let’s go over each factor. For the expected return, Cedar has done extremely well this year, coming in at 30% return. This is a stellar number and probably won’t repeat itself. A 15% annual return is more realistic going forward. As Cedar Capital continues to put up good performances, the portfolio manager is raising new assets as well. Cedar took in $100 million of new assets this year. Going forward, you expect asset inflow to continue at the same pace. You are offered 1% of the carry for next year, which is a great start. You expect to continue to perform well, and your share of the carry be raised by 0.25% per year going forward. With these assumptions, you would be getting $225,000 in bonus next year. That’s great for you. Even better, you are on track to take down a bonus of over $1 million dollars by year 5. This is how you can build your wealth at a hedge fund by getting carry. There is no free lunch. Every great opportunity has a risk. Let’s also think about the downside scenario to getting your $1 million dollar bonus. We’ll sensitize each of the 3 factors. Suppose that 15% annual return is aggressive. Given the bull market we’ve had, perhaps it’d be difficult to get 15% returns in a soon-to-be down market. Let’s assume that Cedar Capital would generate a 5% annual return going forward, slightly below the historical equity market average return. Because of the lower return and general market decline, it will be harder to raise new assets. There will be no asset inflows over the next 5 years. Because of the tougher times ahead, your carry share would remain at 1%. You’ll bring in just $75,000 next year. And in 5 years, you won’t even cross over the $100,000 mark. That’s not a good scenario. You probably would’ve been better off at your current job. Getting carry is a double-edged sword. As you can see from our example, your fate will be tied to the fortunes of the fund. By getting carry, you will become a millionaire in your 30s if the fund does well. However, if the fund doesn’t perform as planned, then you would make more money in traditional asset management, investment banking, sell-side research, and consulting. When you join a small hedge fund and get carry, your risk / reward ratio is amplified. There is no free lunch. Therefore it’s very important to vet the fund and the portfolio manager before you join a small hedge fund. Do you believe in the investment process and the team? Do you have conviction in the fund’s ability to generate alpha? If so, join the fund, get the carry, and ride the ship into the sea. You’ll either find your treasure, or come back on a rescue boat ready for your next adventure. Can I Move from Fund of Funds to Hedge Fund?